1. Plan your trip and inform others about the route you have selected. Plan your trip based on the group’s abilities, and always include alternative options. Obtain current information about the area and the weather conditions. Listen to the advice of seasoned mountaineers where possible. Ensure you have sufficient knowledge and practical skills to complete this trip. Respect the natural environment. Plan ahead and do not leave any litter behind you. Arrange meeting points during the trip that don’t require mobile coverage or accurate timing. Is your planning sufficient to guarantee an enjoyable trip no matter what? 2. Adapt the planned routes according to ability and conditions. Assess the conditions continuously and adjust your plans accordingly. Travelling with others is safer and means you will have someone to share your experiences with. If you’re travelling alone, exercise caution. Do not embark on a long trip without sufficient experience. You must be able to take care of yourself as well as the others in your group. Be considerate of other hikers. Make sure you have read The Right of Access and its requirements. Make sure your group maintains an open and direct line of communication at all times. Can you complete the trip under these conditions and with this group? 3. Pay attention to the weather and the avalanche warnings. Always check the weather forecast and avalanche warnings to see what impact they have on the area. Follow the advice and choose a gentler terrain when conditions are too demanding. Check the conditions on yr.no, storm.no and varsom.no. Monitor the development of the weather and avalanche conditions along the way. Bear in mind that plans may need to be adjusted. 4. Be prepared for bad weather and frost, even on short trips. Dress appropriately for the weather, and the terrain. Remember that the weather changes quickly in the mountains. 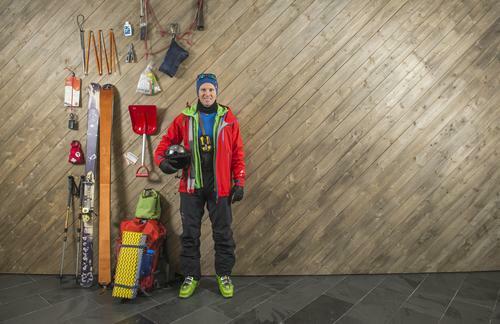 Bring extra clothing, and the equipment your route and terrain requires. Extra food and drink can help save lives, if the trip takes longer than planned or you have to wait for help. Is your group equipped to deal with a sudden change in weather? 5. Bring the necessary equipment so you can help yourself and others. In the winter, you need a windsack/bivy sack, sleeping pad, sleeping bag and a shovel so that you can spend the night outdoors if you have to. A windsack can save lives. Bring a high-visibility vest or a headlight, that will make it easier to find you if necessary. Bring a first aid kit so you can help yourself and others. Always use a transmitter/receiver, and have an avalanche probe and a shovel if you are traveling in avalanche prone terrain. Pack smart! Packing lists for different tours can be found at ut.no. Mobile phones can be a useful tool, but remember that they do not work in all situations and areas. If an accident occurs, alert the police at 112, go for help or try to notify someone with other means. Are you able to take care of yourself and help others? 6. Choose safe routes. Recognize avalanche terrain and unsafe ice. Take an active decision to avoid terrain that is prone to avalanches, and plan your route well. Be aware that avalanches can start in drops higher than five meters and steeper than 30 degrees. Even if you walk in flat terrain, you can trigger an avalanche on the mountainside above you. 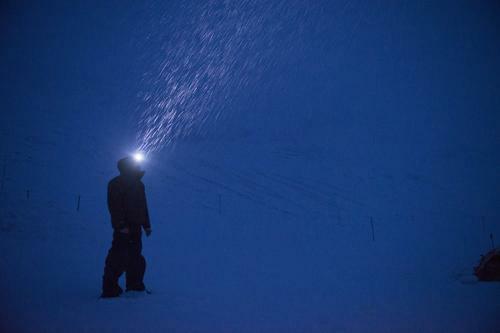 An avalanche dropout zone can be three times the height of the drop. Avoid terrain traps, such as narrow gorges. Consider what will happen if there is an avalanche. Be aware that a cornice can break off when you walk on a mountain ridge. Be aware of ice conditions when you walk on regulated lakes and rivers. Can an avalanche happen where I plan to go? What will the consequence be? 7. Use a map and a compass. Always know where you are. 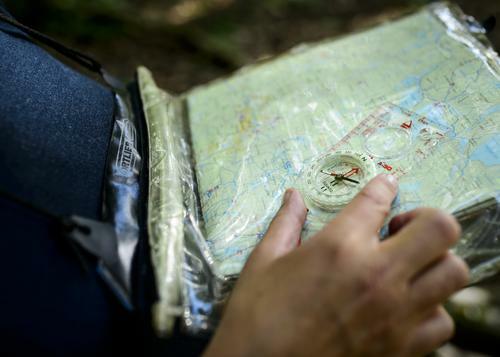 A map and compass are an essential basic equipment that always work. Pay attention to the map even when hiking on a marked trail. Knowing where you are on the map, makes for a better hiking experience. GPS and other electronic aids are helpful, but make sure you have extra batteries. 8. Don’t be ashamed to turn around. Evaluate your route continuously and if conditions are becoming difficult, choose your best alternative long before you or group members become exhausted. Have the circumstances changed? Should you turn around? Is anyone in your group have problems completing the route? Should the group turn around? Enjoy the hike for its own sake, and remember that there will be other opportunities if it is too challenging today. 9. Conserve your energy and seek shelter if necessary. Adjust your hiking speed to the weakest member of the group, and make sure that everyone can keep up. Remember to eat and drink frequently. When you exert yourself, your body needs more fluids than you may feel you need. Don’t wait until you are exhausted before you seek shelter. Strong winds will tire you out quickly. Use your windsack or dig a snow cave before it’s too late. Are you able to get back to your base? Do you know where the nearest shelter is?